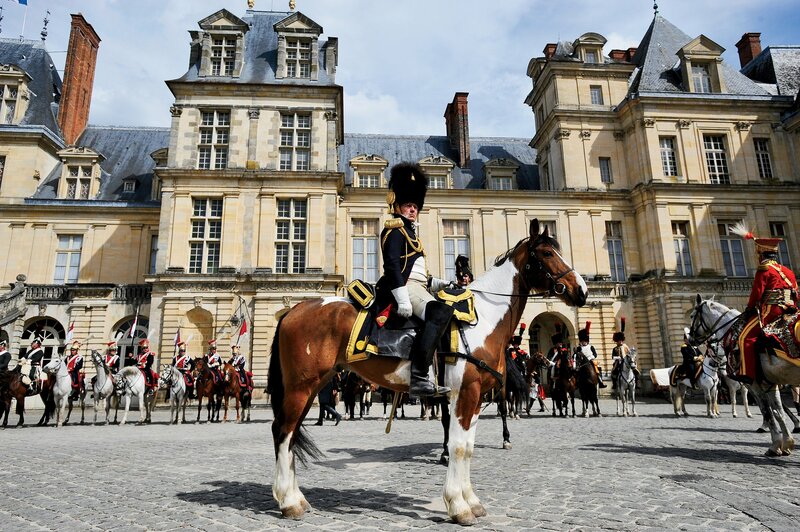 Under a clear blue sky, the Emperor Napoleon, wearing his trademark black felt bicorne hat, green tunic, white breeches and riding boots, emerges at the top of a stone staircase and, with a steady gaze and a salute, acknowledges the thousands assembled in the cobbled courtyard below. Behind him are his generals, clad in gaudy uniforms and plumed hats, with swords strapped to their waists. Stood at attention or on horseback in the courtyard are several hundred Imperial Guardsmen in their bearskin shakos, many sporting a gold earring, a sign of their elite status. The veterans of the Old Guard were Napoleon’s favorite troops. He nicknamed them “Les Grognards”—the grumblers—because they were bold enough to complain in front of him. Beyond them, crowding the square and the neighboring streets, stand around 40,000 ordinary French citizens. The stocky Corsican has ruled France for 15 years, the last 10 as “Emperor of the French,” and his armies have conquered much of Europe. Now, after defeat on the battlefield by a coalition of rival nations, the occupation of Paris and his abdication, Napoleon is about to deliver an emotional farewell to those who have remained loyal. The setting is the main courtyard of the magnificent château of Fontainebleau, one hour south of Paris. The date is April 20, 2014. In real life, Napoleon is Franck Samson, a French lawyer who, with the aid of a black wig, bears a striking resemblance to Bonaparte and has played the part for a decade. Like Samson, all the generals, the Imperial Guard, other regiments and the camp followers in period costume, 500 in all, are unpaid enthusiasts who spend thousands of euros on their sumptuous outfits. But “Vive l’Empereur!” is not a cry that echoes throughout France much anymore. Not everyone is a fan, then or now. In the spring of 1814, as Napoleon traveled through southern France en route to exile, he was jeered by onlookers. His lust for power had left more than 1 million French dead. People were weary of war. The following year, like the Terminator, Napoleon was back. But only for a brief 100 days before his final defeat at Waterloo and a second exile, on Saint Helena, a speck of land in the South Atlantic, where he died. Two hundred years on, the French still cannot agree on whether Napoleon was a hero or a villain. French politicians and institutions in particular appear nervous about marking the 200th anniversary of Napoleon’s exile. 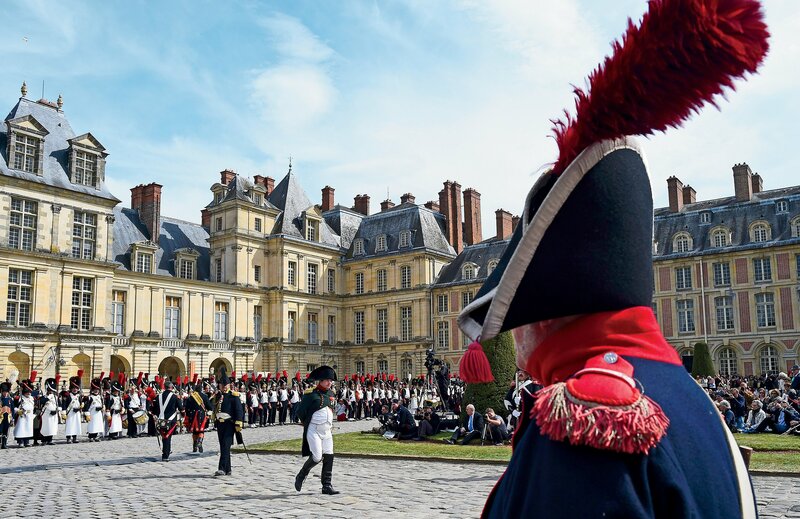 The cost of the Fontainebleau “farewell” and scores of related events over three weekends was shouldered not by the central government in Paris but by the local château, a historic monument and UNESCO World Heritage site, and the town of Fontainebleau. While the 200th anniversary of the French Revolution that toppled the monarchy and delivered thousands to death by guillotine was officially celebrated in 1989, Napoleonic anniversaries are neither officially marked nor celebrated. For example, a decade ago, the president and prime minister—at the time, Jacques Chirac and Dominque de Villepin—boycotted a ceremony marking the 200th anniversary of the battle of Austerlitz, Napoleon’s greatest military victory. “It’s almost as if Napoleon Bonaparte is not part of the national story,” Hicks tells Newsweek. In 2010 an opinion poll in France asked who was the most important man in French history. Napoleon came second, behind General Charles de Gaulle, who led France from exile during the German occupation in World War II and served as a postwar president. On the streets of Paris, there are just two statues of Napoleon. One stands beneath the clock tower at Les Invalides (a military hospital), the other atop a column in the Place Vendôme. Napoleon’s red marble tomb, in a crypt under the Invalides dome, is magnificent, perhaps because his remains were interred there during France’s Second Empire, when his nephew, Napoleon III, was on the throne. There are no squares, nor places, nor boulevards named for Napoleon and only one narrow street, the rue Bonaparte, running from the Luxembourg Gardens to the River Seine. And, that, too, is thanks to Napoleon III. The row was enlivened in March when Lionel Jospin, the Socialist former prime minister, published The Napoleonic Evil, which topped the best-seller lists and triggered a stormy debate. “I am intrigued by the gap between the glory of Napoleon and the actual results he delivered in France and Europe,” Jospin tells Newsweek. He says Napoleon was “an obvious failure”—bad for France and the rest of Europe. When he was shown the door, France was isolated, beaten, occupied, dominated, hated and smaller than before. What’s more, Napoleon smothered the forces of emancipation awakened by the French and American revolutions and enabled the survival and restoration of monarchies. Some of the legacies with which Napoleon is credited, including the Civil Code, the comprehensive legal system replacing a hodgepodge of feudal laws, were proposed during the revolution, Jospin argues, though he acknowledges that Napoleon actually delivered them. “He guaranteed some principles of the revolution and, at the same time, changed its course, finished it and betrayed it,” Jospin tells Newsweek. For instance, Napoleon reintroduced slavery in French colonies, revived a system that allowed the rich to dodge conscription in the military and did nothing to advance gender equality. He also crowned himself emperor, but the genuine kings who surrounded him were not convinced. Always a warrior first, he tried to represent himself as a Caesar, and he wears a Roman toga on the bas-reliefs in his tomb. His coronation crown, a laurel wreath made of gold, sent the same message. His icon, the eagle, was also borrowed from Rome. But Caesar’s legitimacy depended on military victories. Ultimately, Napoleon suffered too many defeats. A month before crowning himself emperor, Napoleon sought approval for establishing an empire from the French in a plebiscite; 3,572,329 voted in favor, 2,567 against. If that landslide resembles an election in North Korea, well, this was no secret ballot. Each “yes” or “no” was recorded, along with the name and address of the voter. Evidently, an overwhelming majority knew which side their baguette was buttered on. Napoleon enthusiasts tell a different story. David Chanteranne, editor of a magazine published by Napoléonic Memory, France’s oldest and largest Napoleonic association, cites some of Napoleon’s achievements: the Civil Code, the Council of State, the Bank of France, the National Audit office, a centralized and coherent administrative system, lycées, universities, centers of advanced learning known as école normal, chambers of commerce, the metric system and freedom of religion. As it is, these institutions continue to function and underpin French society. Indeed, many were copied in countries conquered by Napoleon, such as Italy, Germany and Poland, and laid the foundations for the modern state. In the event, the old order was never restored in France. When Louis XVIII became emperor in 1814, he served as a constitutional monarch. “The people who met him were fascinated by his charm. And today, even the most hostile to Napoleon also face this charm. So there is a difficulty to apprehend the duality of this character. He was born from the revolution, he extended and finished it, and after 1804 he turns into a despot, a dictator,” Guégan tells Newsweek. In France, Guégan says, there is a kind of nostalgia, not for dictatorship but for strong leaders. “Our age is suffering a lack of imagination and political utopia,” he says. 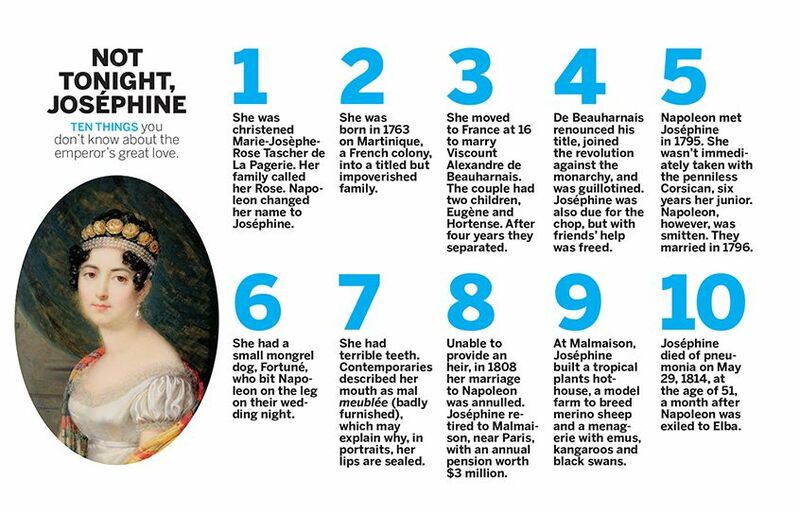 What’s more, the French are not the only ones fascinated by Napoleon. Hundreds of groups worldwide study, discuss and venerate him; stage re-enactments of his battles in costume; throw lavish balls; and stage events. J. David Markham, a North American scholar and president of the International Napoleonic Society, says the French fascination with Napoleon is perfectly reasonable. “The whole world is fascinated. More books have been written about him than anyone in history,” Markham tells Newsweek. As prices of Napoleonic memorabilia continue to rise at auctions in Europe and North America, a distinct shortage of items for sale has emerged. A lock of Napoleon’s hair, a ring and other relics were recently stolen from a museum in Melbourne, Australia. At an auction in France, the soiled nightshirt in which he died was withdrawn after descendants of the original owners became afraid it would be sold to a foreigner and leave France. They won a court injunction preventing its sale. Will the fascination with Napoleon continue for another 200 years? In France, at least, enthusiasm looks set to diminish. Napoleon and his exploits are scarcely mentioned in French schools anymore.